Saturn is seen with its moon Tethys at lower right. Image released Jan. 11, 2016. An amazing new photo serves as a reminder of just how big Saturn is. The beautiful ringed planet looms over its moon Tethys, reducing the 660-mile-wide (1,062 kilometers) satellite to a tiny dot in the new image, which was captured by NASA's Cassini spacecraft in March 2015 but just released today (Jan. 11). 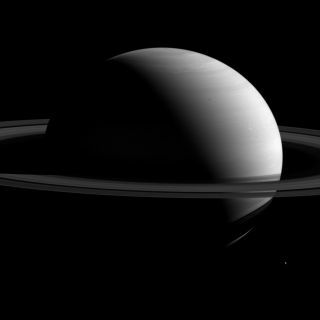 "The view was acquired at a distance of approximately 1.6 million miles (2.6 million km) from Saturn. Image scale is 10 miles (16 km) per pixel," NASA officials wrote in a description of the photo. "Tethys is slightly closer at 1.5 million miles (2.4 million km) away, for an image scale of 9 miles (km) per pixel." Saturn's diameter is about 72,400 miles (116,500 km), making the gas giant more than 9 times wider than Earth. In fact, 763 Earths could fit inside Saturn — but the ringed planet is just 95 times more massive than Earth, because Saturn is composed primarily of gas, whereas Earth is a rocky world. Tethys is the fifth-largest of Saturn's 62 known moons; only Titan, Rhea, Iapetus and Dione are bigger. Tethys is an icy, heavily cratered world with two dramatic surface features: a 280-mile-wide (450 km) impact basin called Odysseus, which is nearly half as wide as the satellite itself; and a canyon called Ithaca Chasma that's 1,240 miles (2,000 km) long and, in places, 62 miles (100 km) across. The $3.2 billion Cassini-Huygens mission — a joint project involving NASA, the European Space Agency and the Italian Space Agency — launched in October 1997 and reached the Saturn system in July 2004. The Cassini mothership carried a lander called Huygens, which successfully touched down on the surface of Saturn's huge moon Titan in January 2005. The Cassini orbiter will continue studying the ringed planet and its many moons through September 2017, when its mission will end with an intentional death dive into Saturn's thick atmosphere. This measure will be taken to ensure that the spacecraft doesn't contaminate Titan or the icy moon Enceladus, two Saturn satellites that could potentially host life.